Drift and slide like never before in an arcade rally game taken to the next level! Rise: Race The Future is car racing game made and published by VD-dev. Precision drifts, jumps and water zones. 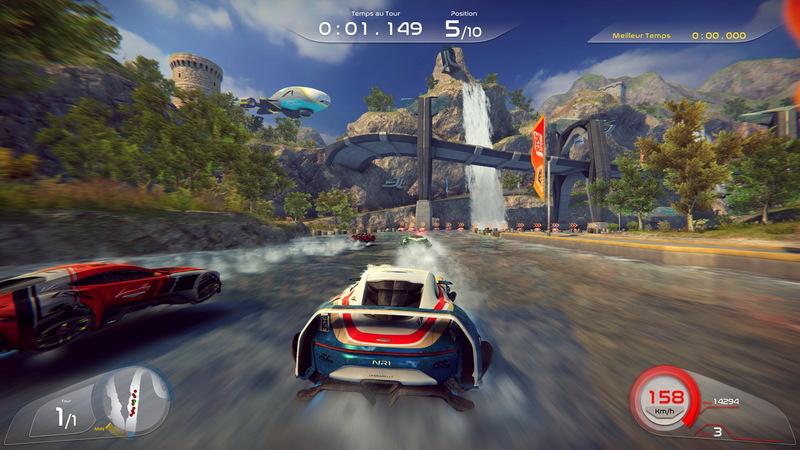 The unique gameplay defined as “precision drifting” will suit every player looking for technical and precise controls combined with the immediate fun and ease of an arcade game. RISE: Race The Future is a racing game set in a near future where a new kind of wheel technology will let you drift on all type of terrains and especially on water. RISE: Race The Future is a racing game from the studio VD-DEV renown for their technical skills. Experience the most addictive racing gameplay! Drift and slide like never before thanks to an exceptional fluid and precise physics-based slippery handling. Unique futuristic cars, smooth powerslides, jumps and water zones take old-school rally arcade games to the next level of fun! Players can master different techniques for overtaking and exiting a corner thanks to the combination of several boost systems which set the game appart from usual rally games. Great game, it's arcade but with very subtle controls. Perfect when you don't have too much time to play but want to have fun like in Sega Rally but with more techniques to slide the cars.